What is donor-centric nonprofit copy? 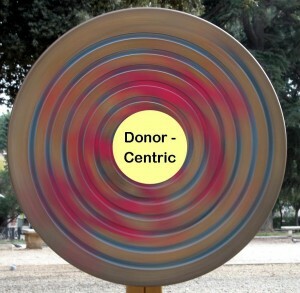 I begin defining donor-centric copy this way: Nonprofit organizations must put the donor at the center of everything. The donor – the person giving you the money you need to operate – is the reason everything gets done. The donor is the reason your org is successful. It’s the donor making sure farmers in Peru know how to rotate crops for better yield year-after-year. It’s the donor making it possible for those water wells in Africa to get drilled. So if the donor is at the heart of all you do, then why are your fundraising appeals all about your nonprofit? Fantastic Charity saved over 6,300 lives this year alone. We sent more than 120 tons of food and life-saving medical supplies to people suffering from nations in civil war, from earthquakes and other natural disasters, and from intense poverty. We’re there when people need help. Do you realize that you helped save over 6,300 lives during this past year as a supporter of Fantastic Charity? It was a tough year for many people around the world, but you made it a lot better for some of them. Thank you. You make the donor the hero of your nonprofit work. And you also specifically show how they make a difference in the world with clear objectives. You keep them informed of the progress they’re helping you make (i.e., explain in measurable terms what their past donations have accomplished). And you make certain they receive a prompt and meaningful thank-you letter whenever a gift if made. Oh, and please don’t flood them with solicitations. You can ask too often, so test to see what frequency works best for your nonprofit so your attrition doesn’t skyrocket. Donors – your heroes. Please treat them as such through donor-centric fundraising. Like this? Found it useful? Please share!